Saffron, Tulsi & Sandalwood Exfoliating Ubtan Description: Made from ancient Indian beautification secrets, this ubtan will leave your skin glowing and rejuvenated. 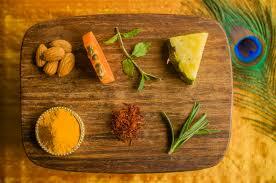 The nourishing properties of Turmeric and Saffron help in restoring your skin, improving skin texture and removing tan. Orange peel, manjistha and rose petals add the extra radiance required for your everyday beauty regimes. Ingredients - Besan, Haldi, Sugar, Saffron, Orange Peel Powder, Manjistha, Tulsi Powder, Sandalwood Powder, Rose Petal Powder, Oats Flour, Wheat Flour Choker, Coconut Husk ,coffee bean powder ,lemon peel powder. Directions to use - mix with rosewater or aloe vera for normal skin. Use with milk for dry skin. Use with yogurt for oily skin. Mix a teaspoon of fresh tomato juice to reduce pigmentation. Apply on your face and body and keep for 10 minutes. Gently wash with fresh water. Remove immediately if you experience any itching or burning sensation.